We begin in the Court Dancer’s little garden, where everyone has gathered to celebrate Janmashtami. 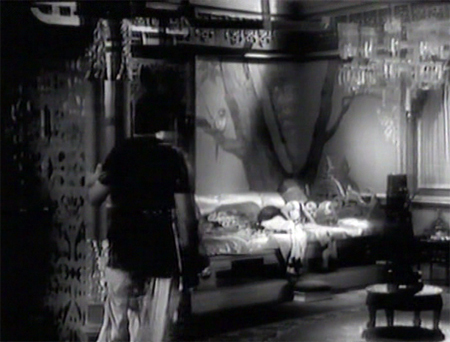 Prince Chandrakirti (Prithviraj) appears to visit his ladylove Indrani. He is to be crowned King by his father in another month and he is determined to marry Indrani, although his father frowns upon the liaison. Their meeting is interrupted by the Captain of the Guards (Thapan). The Captain has been sent by King Jaisingh to ask Chandra to meet the approaching procession of High Priest Koshishwar, an esteemed holy man carrying a vial of the Sacred Dust from the feet of the Lord. In any case Chandra refuses to leave Indrani’s side and she now performs a Ras Leela dance for him and a bunch of priests who have just arrived. Sadhona is unbelievably graceful. 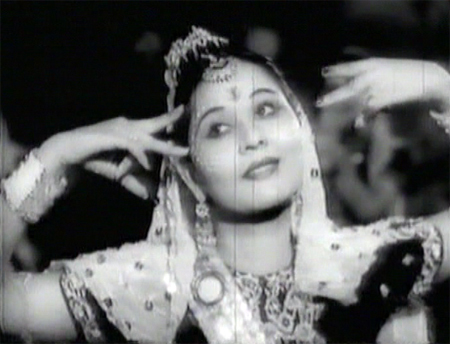 I would love to see her in something else (1937’s Alibaba for instance! Make it happen, universe!). 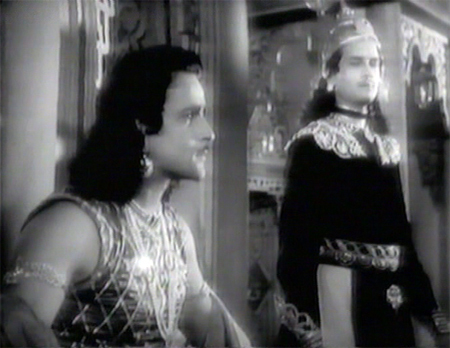 King Jaisingh (Nyampalli) arrives just as the dance ends to chastise Chandra for not going to meet the High Priest. But Koshishwar (Jal Khambata) is already there in the midst of the priests, and praises Indrani’s performance as Radha to the skies. He approaches her to apply the Sacred Dust and is stopped by the horrified King, who informs Koshishwar that she is a mere dancer. The priest himself recoils in horror on this discovery (I am not clear on who he thought she might be, given that she was after all dancing, but never mind). Poor Indrani! Denied the Sacred Dust, she is further humiliated later when she travels to the temple with the royal entourage and is refused admittance. 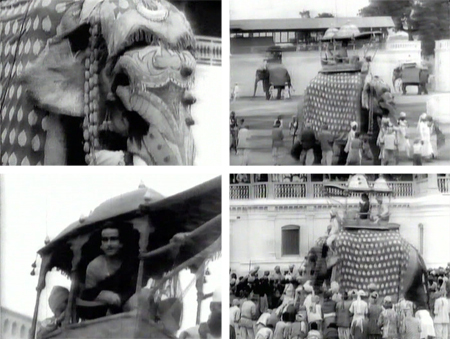 The procession is quite wonderful and must have been quite a production: there are lots of elephants, and it’s a typically lavish Wadia scene. Prince Chandra, who witnessed her humiliation at the large temple, has followed her on horseback. He promises her that when he becomes King and marries her, he will open all the temples in Manipur to everyone. It’s evident by now that Chandra and Indrani are good and devout people who genuinely love each other wholeheartedly. And my goodness they would have gorgeous children! But the King has decided to marry Chandra to the Princess of a neighboring kingdom to cement an alliance with them and prevent war from breaking out. He doesn’t take Chandra’s devotion to Indrani seriously until Chandra rejects the crown and his inheritance in favor of marrying her. 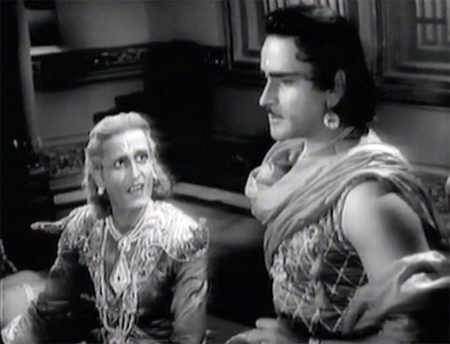 Enraged, King Jaisingh vows to have her arrested and executed, but Koshishwar—who still remembers her luminous performance as Radha—asks for a chance to talk with her instead. He finds her in the “broken temple” (as it is called throughout) offering prayers of thanks for Chandra’s love, and asks her to sacrifice that love for the sake of peace for Manipur and its people. There is another obstacle in the form of the Captain of the Guards, who wants Indrani himself and is willing to instigate trouble against both of them if she doesn’t accept him. Will Indrani give up Chandra? Will Chandra accept her sacrifice if she does? Can this love story end happily? As I said, it’s a simple (and short, too, at an hour and twenty minutes or so) story with a simple message, and there is a LOT of pretty along the way. 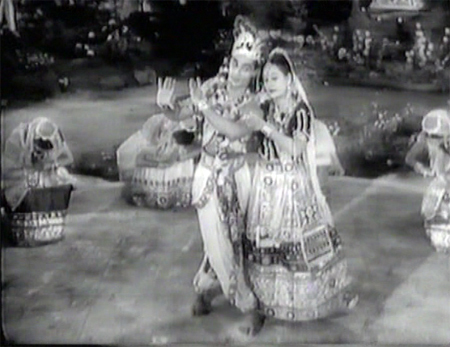 The dance numbers are beautifully choreographed and performed, with a lovely Wadia special-effects touch at one point to explain how the hand movements of the dance represent the stars and the moon. I love the costumes and sets and as usual would give my eye-teeth to get my hands on some of that stuff! 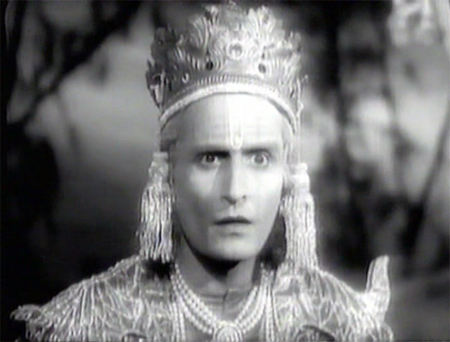 Sadhona Bose is credited at the beginning for costume design, as well. 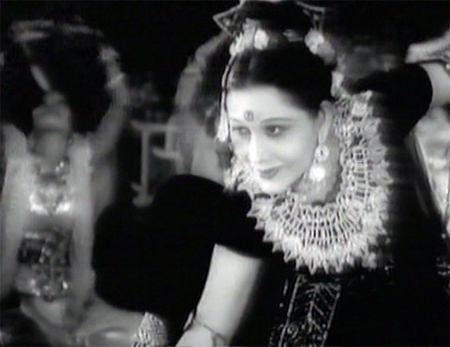 Her husband (Bengali director) Modhu Bose directed the film, and the lovely music is by Timir Baran—who apparently was also Sadhona’s “good friend” at one time, according to her pretty extensive biography on imdb. It doesn’t sound like she had a very happy life in later years, but she was really just wonderful in this, a beautiful dancer. It is truly an historical gem. Posted on June 8, 2010 at 12:19 pm in Hindi film history, Hindi movies	| RSS feed You can skip to the end and leave a reply. Love your screencaps of the hand (mudras). That’s why I read your blog–on my own I might never nocice these things. Yes, and it’s kind of fun that India is still exploring ways to appeal to a wider audience. And without people like you I would not know those hand movements are called mudras! :) Thank you! He does, but he looks like Shashi too :) Or maybe we should say they look like HIM! 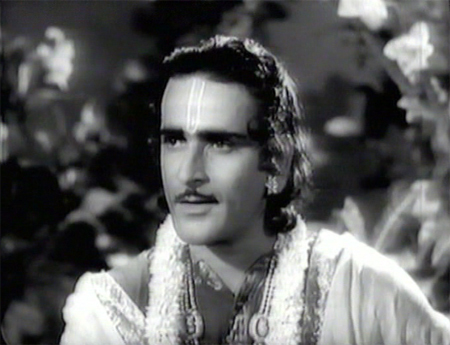 Prithviraj kapoor was such an handsome guy! Love him! They made good film with good messages that time! since this is an english film. How is the language? Does it sound like the scene in which Himanshu Rai speaks to some bird or something about his beloved? I just kind of sat and melted into a puddle watching him :) The language is okay, it’s interesting because the pronunciation is just fine but the rhythm or cadence of their speech takes some getting used to. You are thinking of Karma and the squirrel scene too :) It’s very like that! A question about the English used, is it British English, or what might be called Indian English, or something in between? Also, for your American readers, Turner Classic Movies is showing “A Throw of Dice” (1930) at 12:30 am on Monday, July 26. It’s somewhere in-between…very British a la 1940s Hollywood, but with an Indian accent! Not seen the movie. Sounds like a feel-good, sweet movie of that period. (I am assuming here that all ends well, that Indrani and the would-be father-in-law (henceforth to be known as WBFIL) get together and the Captain of the Guards is put in his place). Have now got this pic in my head of WBFIL in his deep voice going “Bahu….”. And memsaab appears. Ha ha :) Honestly, I did not feel very bahu-like towards him! His voice too was so much like Shashi’s in his English-speaking films—it wasn’t as deep as it became later (think he had throat cancer or something, which caused it to change). @ memsaab: I can understand you not feeling very much like bahu but a dullhan. but it will be a WBIFL from Kal Aaj Aur Kal (1971). You will love him! Yes, I have seen him in films where he was more WBFIL like than WBD :) This isn’t one of them though! I too was curious about the English so I checked out the Youtube excerpts. Prithiviraj’s English sounds like it is better than Raj Kapoor’s. My assessment– a little like Dev Anand in Guide (English version). Dev Anand’s English is better of course. Also notice the Bengali actor’s(Sadhana) English is better than the Punjabi’s(WBFIL)–just like in India even today (okay that’s a stereotype and I will get into trouble for it). They all spoke English way better than I speak Hindi so I cannot criticize! will look for this film — have a series of postcards that are of wadia movietone movie posters, although this film isn’t among them. Also, LOVE your doll! Where did you find her? I have a 7-year old niece for whom I buy dolls whenever I travel — I didn’t get her one on my first trip to India. Hope to on my second. Sally – you will get a lot of those dolls in Tamil Nadu – I think they are called “Thanjavur Bombai” ie Thajavur dolls that shake their head. The actual dance style may vary ie it could be Bharatanatyam rather than Manipuri. If you go to “Puzham Puhar” – the Tamil Nadu Government Emporium in any State capital in India, you may find such dolls. You can even try the Mainpuri State Emporium if you happen to be in Delhi – I presume Delhi has this Emporium. Sadly the southern states don’t have state emporiums of North East. The screencaps are awesome especillay the mudras and the elephant scenes. Where did you find this movie? It must be really hard to find such oldies. Muz sent it to me, his father taped it from a television channel in England. Cent per cent in agreement with you Filmbuff, it is question of money honey bole toh SPONSORS hai kya,? first the commercial interest then we talk. It is sad STATE of affairs .But thanks to Internet we can see the glorious history of past movies and remember the folks who made it. Otherwise they would be all destined to a dustbin, no doubt in my mind about that. Thanks for confirming my view! Oh, I need to get hold of this film! Have heard about it, but this is the first time I’ve come across a synopsis or a review of it (well, not that I’ve actively searched, but still). 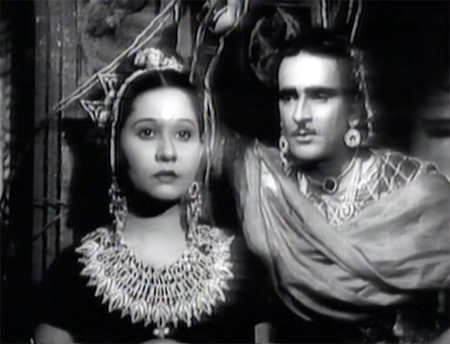 Sadhona Bose looks gorgeous, as does Prithviraj Kapoor. Have just discovered that a search on youtube for ‘Raj Nartaki’ yields a bunch of excerpts. Will go and check them out! Yes, Richard links to Nivedita’s writeup of it below which is lovely! I had forgotten about it (BAD MEMSAAB) but she has uploaded a lot of great old cinema to youtube. Thanks for the review. Young Prithviraj is always good for screen-caps. 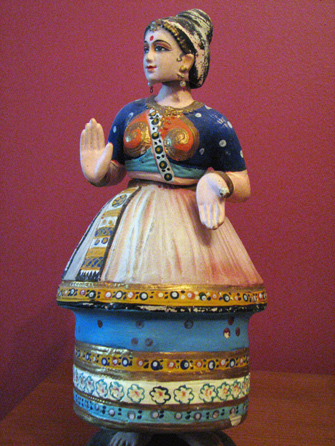 I bought that doll in the Central Cottage Emporium in Delhi, only with a different costume: a full length ghagra. There were also some in the state emporiums on Baba Kharag Singh Marg in Delhi, as I visited several, cannot remember if it was in the TN one or not. Nice review and love the screen caps! But, no, I never had the chance to watch it all the way through. Sadhona Bose is just beautiful and so graceful. The bio of her on imdb is pretty thorough too, which is unusual! The king obviously doesn’t mind marrying off a dancer to a neighboring prince. Would that prince have no objections to her lowly caste?? Would love to see this film. I didn’t even know of Sadhona before this, so great job again, Memsaab, in documenting Indian film history. Oops, sorry. My bad. I knew it didn’t sound right. one thing I noted, the playing time for this movie is all different ie India:126 min (Hindi version) | India:144 min (Bengali version) | USA:86 min (English version). This as per IMDB. p.s. hv to see Rajput Ramani from 1936 which Trini bro had u/l, and unfort I missed it, luckily one seeder to help out. Probably songs were chopped. The flow was nice though, it didn’t feel edited as so many do. What a little jewel of a movie this is. 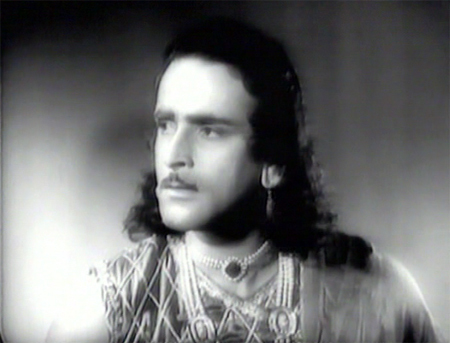 As always, pix of Prithvi’s youth remind me of Shammi’s mustachoied days, but at the same time, Prithvi’s own personality is so strong that it is evident even in screen caps (which are lovely- thank you). I really appreciate the outsdoor shots- they were fairly rare then, and always fun. It is a lovely film…I should post more screenshots, I took a whole bunch of them. Of course, they are mostly of Prithviraj!!! LOL! Thanks everyone for the suggestions on where to find dolls of India. I will surely be shopping at the emporiums on my next trip! And yes, I tried to find a DVD of this film, to no avail (even checked Induna). You are lucky to have gotten a copy! I hope some of these older films will become available on DVD at some point. Read w/ interest that Mrinal Sen’s “Khandar” has been restored and was shown at Cannes this year. Hopefully it will be available soon! No, I think this isn’t out, and if it were it would have a huge ugly logo slapped over it and scenes and songs missing probably. DESPAIR! I saw Khandar at the London Film Festival when it was first made. Fine film, beautiful cinematography and a very realistic take on the venerable Indian film “well-off-educated-spohisticated-city person-meets-beautiful-rural-young-person=fall-in-love”….and the cinematography was wonderful. Never knew that it was never released in cinemas. 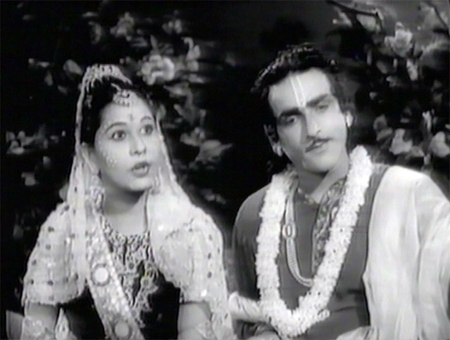 Shabana Azmi & Nasiruddin Shah at the height of their restrained acting powers are always a treat. However, as it is a good 25 years since the one and only time I saw it, so I do not what I would say about it now. When I was a kid, I would not touch an old movie with a barge pole. At that time, any movie older than two years was an old movie for me. I remember not watching movies like Samadhi (1971), Haqeeqat(1964) etc when they were being shown for free in 1974 in my locality, since they were too old and boring for my liking. But now, I would love to watch movies like “Raj Nartaki”, which is nearly 70 years old. Have I grown old ? Sure, I’d love to see them—my email is memsaabstory at gmail dot com. if u r interested in hollywood magazines.u can have a look in ma profile itself. i m sittin in front of ma computer,do expect a early reply. You have really a knack,skill and a keen eye to absorb the movie details,seen and implied.Your review is very enjoyable. Sadhona Bose looks quite enchanting and impressive in this movie,I agree.